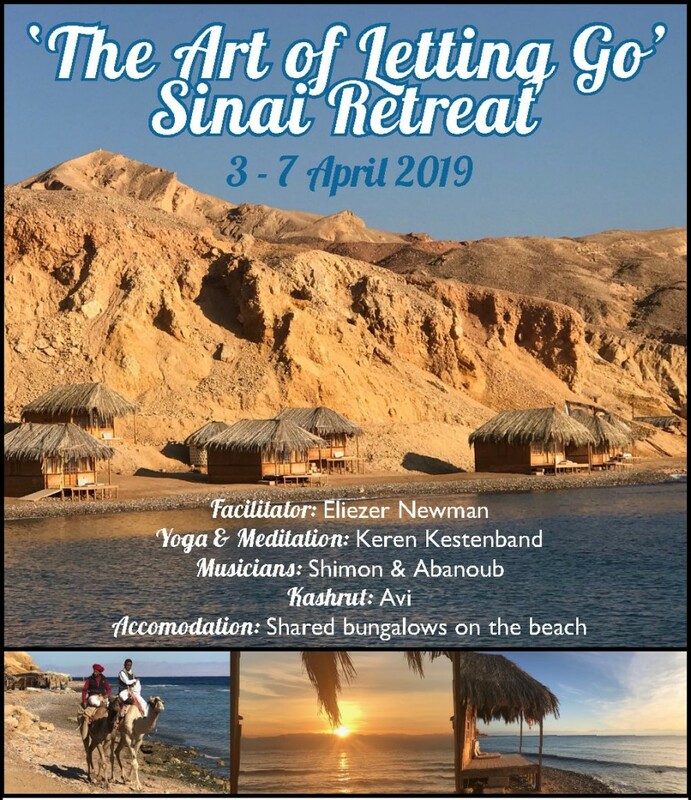 Succat Shalom is delighted to extend to you an exclusive invitation to our “ART OF LETTING GO” Retreat, in Sinai, 3-7 April . This is our 12th retreat and will take place 2 weeks before Pesach. Our 5 day (4 night) retreat Retreat will start on Wed 3 April 2019 11.00am and will end on Sunday 7 April 2019 5.00pm . Registration will be in Eilat at 11.00am. Please Register on time as we will moving together through the Israeli/ Egyptian boarder together to meet our taxi to take us one hour South to the Camp in Sinai. We will be located in one of the most spectacular beach camps, a few miles north of from Nueba. This Eco-friendly camp is one of the most peaceful and tranquil locations on the earth. The multi-coloured mountains stand magnificently around the Red Sea, that is as calm as a lake in most days. We will be sharing recently built wooden bungalows located a few feet from the water edge. Each bungalow has a 4 poster king size bed with another single bed, and a full length balcony overlooking the water. From your bed you can watch the beautiful sun rise each morning which is like looking at a spectacular moving art canvass draw by the Almighty. You will be sharing a bungalow with 1-2 other participants of the same gender. Couples will get a bungalow of their own. Every Jewish festival contains a special energy, and the energy of The Seder Night of Peach has the power to set us free from any all the restrictions that prevent us from living our fullest lives. Many of our constraints are self-imposed, and by finally letting them go, we can grow to become the beautiful divine beings we were born to be. But often we arrive at the Seder Night exhausted from all the cleaning and can often miss this unique opportunity that only comes to us once a year. So to help up prepare better for this wonderful moment, we are inviting you to join us for our “Art of Letting Go” Retreat. Located in the tranquil shores of South Sinai, this is the perfect location to take time off your busy lives and go inward. The retreat will serve 2 meals a day – late breakfast and early dinner. Fresh and healthy vegetarian meals will be made served each day with some fish dishes for those that need it. Feel free to bring your own snacks where necessary. Whilst the meals will not be certified Kosher, we will have a Mashgiach with us who will be overseeing the meals which will use our own pots and cutlery. Each participant will receive a new eco-friendly reusable plate and cutlery to use throughout the retreat. You will be sharing this magical experience with 15 other like-minded participants from across the world. The retreat is open to all ages and all status. Eliezer Newman: Our beloved Eliezer Newman will guide us through a series of experiential sessions aimed at helping us recognise the constraints we are still holding on to, that no longer serve us, and to help us let them go. This is Eliezer’s 6th Retreat with us and we keep invite him back because he is so good at gently allowing us to perceive ourselves from a new perspective of clarity. This is an intimate group and we often learn more from the sharing of other participants. Traveling to Sinai has become more open and accessible to Israelis over the last year. However only those who are comfortable with that risk should attend this retreat. I visited three times in the last month and felt very safe, but each participant should make their own evaluation and if required, arrange their own insurance. We will be monitoring the situation carefully and if the situation becomes more challenging, then the retreat will take place on an Eco Kibbutz 50 kms north of Eilat. Please bring with you NIS 100 for taxes to cross the Israeli Boarder and 400 Egyptian Lira (approx. NIS100) to cross the Egyptian boarder. No taxes are paid on the way back. After the registration in Eilat, we will take you through the boarder controls together and meet the taxi in Egypt to take us to the camp. Likewise we will take you back by taxi on the return to Israel. Taxi cost NIS 50 per person each way. Friends this promises to be an amazing, possibly life changing retreat. Come join us and let us together, break through the walls of our resistance, so that we can bask in Hashem’s blessings, and become free to become the awesome divine beings we were born to be. I really hope you can join us and give yourself this most precious of gifts! STEP 2: Select your Payment Option and secure your reservation. I spent half a day in Jerusalem with Succatshalom last year. It was so well planned, with meetings with various members of the Knesset and journalists. Celebrating Yom Yerushalayim in such a way was thoroughly uplifting. Well done to all the team and in particular to Shlomo who took care to make sure each of us felt really special and included. Taking part in these Jewish studies have added great value and meaning into my life. I am grateful to Mr. Shlomo Godsi for all his hard work for organising and hosting these wonderful lessons. I had the privilege to attend … My only regret is missing on the ones I was unable to attend as each and everyone of them, is enriching and fulfilling. To be able to learn so much in a friendly environment is a ZECHUT and as such I appreciate all the effort Shlomo does in co-ordinating all the various topics and get the best speakers to teach us. 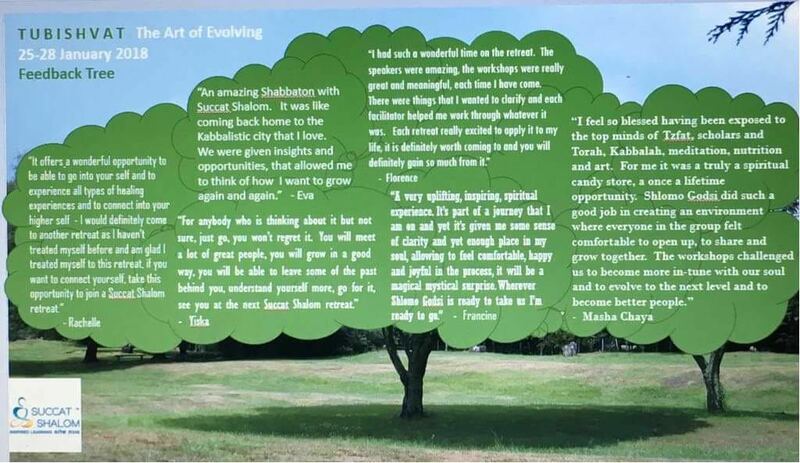 Shlomo’s vision for personal development and creating connection, perfectly aligns the elements of experiential learning, profound personal growth and fun. Wishing him every success for both the Herzliya retreat this Shavuot as well as for Succot. Daniel Frohwein, Personal & Business Impact Specialist. London, England. I was lucky enough to spend a Shabbat with Shlomo and It was really an incredible Shabbat!! The food was amazing, the hospitality, the conversations, that we had at the Shabbat meals, were great. Tzfat is just an incredible place. There is a feeling of spirituality and calmness that is almost tangible and I loved every moment of the Shabbat!! Thank you so much, Shlomo and I look forward to coming again soon!! Thank you for an amazing Shabbat!